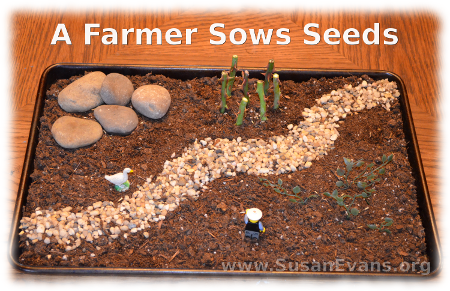 Here is a visual Bible craft to illustrate the story of when a farmer sows seeds. You will find the story in Luke 8:4-15. A farmer sows seeds into four different types of soil: beside the road, among rocks, surrounded by thorns, and in good soil. The seed represents the Word of God. What happens to each seed, and what does each seed represent in our lives, according to Jesus? 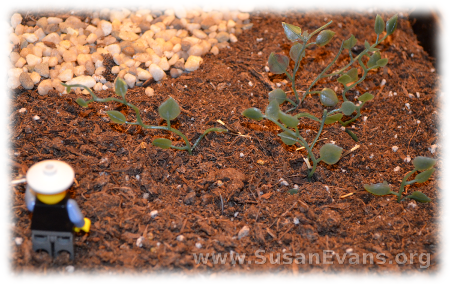 Beside the road: The seed is trampled, and birds eat it up. These people hear the Word of God, but the devil comes and takes it away, so that they don’t believe and are not saved. Among rocks: The seed withers away because it has no water. These people hear and receive the Word of God with joy, but they have no firm root. They shrivel away when temptation comes. Surrounded by thorns: The seed grows up among thorns, and the thorns choke the young plants. These people are choked by worries, riches, and pleasures, so they never mature. In good soil: The seed grows and produces a crop 100 times as great. These people have held fast to the Word and bear fruit with perseverance. 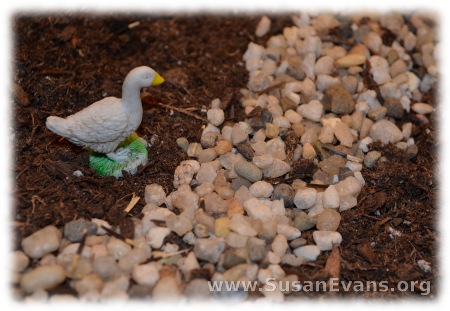 To make this “A Farmer Sows Seeds” craft, you will start with pouring soil on a cookie sheet. Spread pebbles like a winding road across your cookie sheet. I used a spoon to control where the pebbles were going. Place a bird along the side of the road. Then sprinkle some seeds on the road. 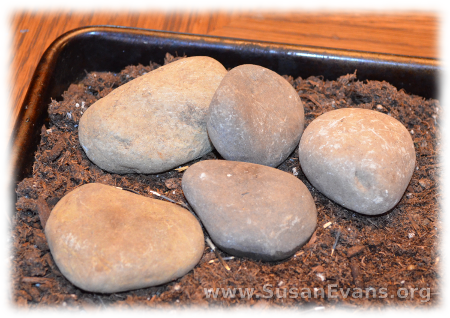 Place some larger rocks in one corner of the cookie sheet. Sprinkle some seeds there. 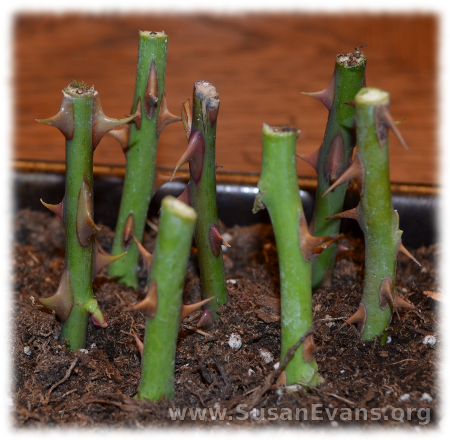 Clip some thorns from your rose bushes outside, and put a small piece of clay on the bottom of each one so they will stand up when you dig a hole and attach the thorn stems directly to the cookie sheet. 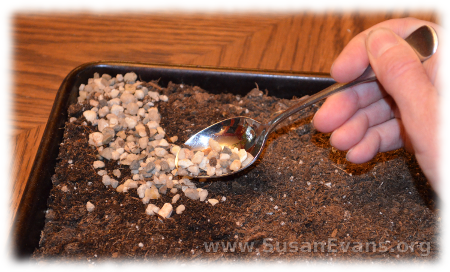 If you have a deeper cookie sheet, you do not need clay because the stems will stab nicely into the deeper soil. Toss some seeds into the thorns area. Now get some real or plastic plants that are green, and place them into the good soil. Sprinkle seeds there. The farmer should be placed into the soil as well. We used a Lego man, and my son stuffed some seeds into his hand. After making the craft, you can tell your kids the story, and this visual reminder will help them to remember the story. Hopefully they will take the story to heart and make sure the soil of their hearts receive the Word of God and persevere in growing closer to God each day! If you enjoyed making this Bible craft of “A Farmer Sows Seeds”, you will love Using Simple Costumes and Props to Teach the Bible. You receive this 2-hour video for free when you sign up for the Unit Study Treasure Vault, which has an enormous Bible section! This entry was posted on Thursday, October 24th, 2013 at 7:44 am	and is filed under Bible. You can follow any responses to this entry through the RSS 2.0 feed. You can skip to the end and leave a response. Pinging is currently not allowed. I love your Bible story craft ideas! I wish I did some of these when I was home schooling my own kids. A Farmer Sows Seeds can be used if you teach Sunday school. Anyway, great ideas! Thanks! Yes, these are great lessons for Sunday schools, for sure! Kids love hands-on activities to learn Bible stories. Cute idea and such a great parable. Thanks for sharing. What a lovely way to illustrate a teaching. Great idea for a Children’s Sermon. I will be using it this Sunday. Thank you so much for sharing! Wow!!! I love this! Cannot wait to try it. Thanks for sharing. My girls would love this demonstration! This is adorable, and so hands-on. I’ve read a few articles recently on a montessori type approach to teaching children Bible stories. The visual and tactile things seem to help them get it.